Home company Company Blog company story ISTQB lucky charm lucky color lucky date Office officemates red red company success story Team teammates Red Spells a Lucky Charm! We are Team Red! 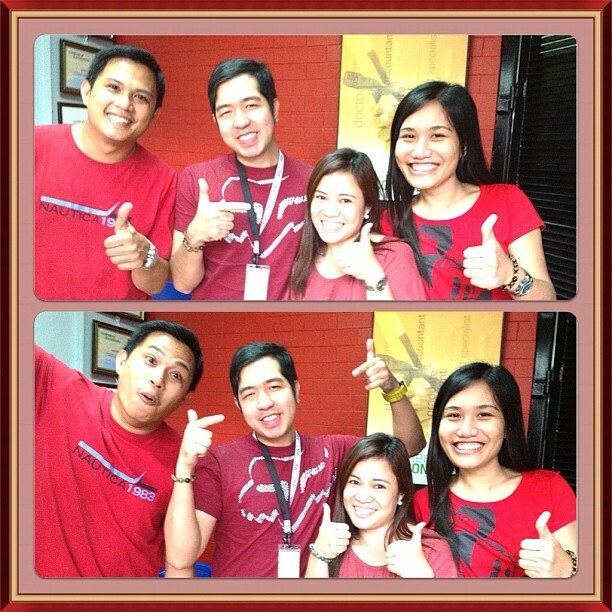 It's such a coincidence that the four of us were all wearing red yesterday, during the day that we took the ISTQB Certification exam. Me and my three teammates took together the said examination on the same batch. We were surprised seeing each other wearing the same color - red! Even the wall in the examination room is also painted in red! That's why right after the exam and right after we passed, we had our souvenir photos. They say that red is a lucky color. And that proves to be true based our own experience! Actually red is my favorite color since birth! I love the color of red. It symbolizes different things such as love, courage, life, and of course lucky charm! The last term is true in our case! Thanks God! It also seems that we attended a red carpet premiere night because of our common red attire. Remember, most of the premiere nights I have already attended have actors wearing red?! Nice!